The idea of posting about our shop encounters is to share some of the conversations we are having with people who encounter our shop. Some of these people walk in from the street because they just want to ask what will happen here, some come to fix broken windows, shutters, tear down walls, some come to council us on insurance policies, some are friends or friends of friends, some are terribly enthusiastic, some are incredibly skeptical, some understand the critical nature of the work right away, others doubt we have a sustainable business model, some dig deep with their questions, some want to walk away to think about what they’ve just heard, everybody wants more concrete examples of what we have in mind. 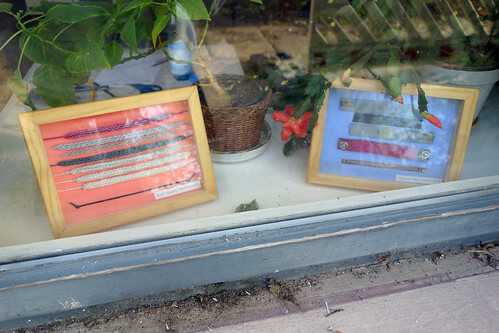 The photos in this post are of our new window display. He came first thing in the morning and it did not take him long to take the measurements of the missing and broken window panes so that he could order the glass cut to size. Before he started, he asked what we are doing with the space and I told him it is going to be a “Schneiderei für Elektronik” (a tailor shop for electronics) and went on to explain that we are opening our shop for one year as an experiment in making custom electronics embedded in textiles so that they can be worn on the body. Then, after he had done the measuring, he came back to me and started asking more questions about our shop. I think the first thing he commented on was that one year is not long enough to start a new business and bring it to the point of making profit. That most businesses take about three years before they start sustaining themselves. I agreed with him, that is is really one of our biggest challenges, to set up and run this project in even less than one year. But that we are lucky not to have to worry about making profit from the tailoring exchange, since we have funding. 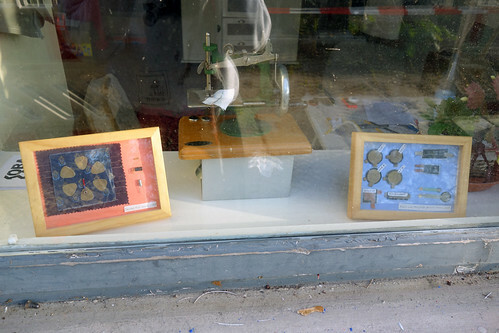 Instead our goal is to collect peoples ideas through the commission exchange and to have conversations about the existence of a shop like this. Then he asked for an example of what kinds of technology we would make. We still don’t have a strategic answer for this question, and it always comes. On the one hand there are generic examples that demonstrate what is technically possible (sensors/motion capture, quantified self, industry 4.0, heated underwear, bike light jackets, sound reactive light-up costumes…) on the other hand there are artistic projects that demonstrate what is conceptually possible (Cosmic Bitcasting, Northbelt, Secretkeeper Gloves, Massage me…) and then there is the approach of craftsmanship, the skilled techniques and textile materials (conductive fibers, threads, fabrics, resistive piezoresistive materials) that we base our practice on. I think my reply to his question was something along the lines of putting sensors on the body and bike light jackets. He understood right away what this meant, and reacted very skeptically. Do we really need this technology? Isn’t all this technology keeping us from using our own senses, our common sense to interpret the world? This kind of reaction is one of our favorites because we can also identify. We are also huge skeptics when it comes to wearing technology for “usefulness”. At the same time we love inventing, building and sharing technology because we believe it is an important tool for change. And this is along the lines of how I responded to his skepticism, affirming that we also agree here, technology is not going to save us, but not understanding technology, not engaging in the invention, production and potentials of technology simply fuels monopolization of power , creating an undemocratic world. By offering “cutting edge” (hate this word) technology in a tailor shop, proposing to the general public that we (the expert makers/craftspeople/engineers) are at your disposal, we’re questioning current technology production trends. He remained very critical, and I’m not quite sure if he was able to catch that we are all about having exactly the kind of critical discussion around technology that he and I were having at that exact moment. I even said something like: “Exactly! Conversations like these are the reason we want to run a shop like this. Bringing together producers and users allows for conversation to happen.” And I think he understood what I said, but I also think it is very hard (even for us) to imagine exactly how this experiment/ these conversations will play out. We need to start. This was over 2 weeks ago and the glass has still not been delivered but he said he will call as soon as it is and then he will be back and I want to be prepared to pick up this conversation. Maybe we already have some prototypes in progress so that what I have to say has a tangible element. She knocked on our window when we were working late one night. She said she already looked in the night before but didn’t dear knock, but now she is really curious to know what we are doing here because it looks like a workshop. She lives in the street and recently came to Berlin to start learning at a carpentry school. She was wearing her work pants. And it was impressive timing because just that day we had been discussing how our customers would experiance our shop/ our story through our collection and one thought experiment we’d played was imagining ourselves wanting to have a custom table made and going to a carpenter and how this interaction would play out. I told her this and she confirmed that a big part of a commissioning process is the conversation you have with the customer to figure out what they want and what you will make for them. We hope local people like her come back into your shop to meet, totally aside from being a customer. We should think of how to advertise our events so that locals will know about them. I started a piece of paper for people to write down their emails so we can start a mailing list. 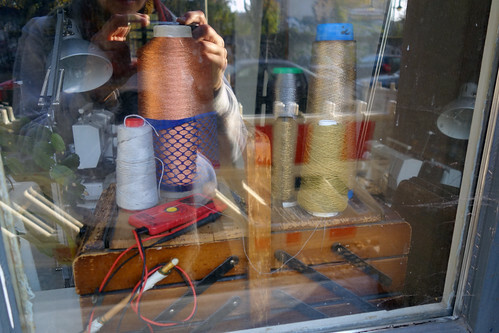 He was pushing his child by in a pram and paused when he saw our new window display (e-textile sensors and conductive threads with multimeter). He looked closely and saw our KOBAKANT logo. He looked in to ask if he could come in. He did not stay long, but told me he “also” works in IOT and is just meeting with a client tomorrow to talk about putting pressure sensors in shoes. He said he will come back in to talk more. It is for these “global village” encounters that having a shop is great.